Special for this weekend, call 02-014-2446 for more details. 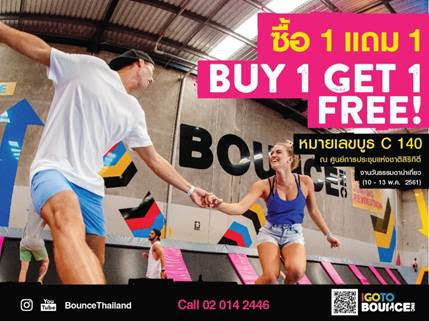 Bangkok 11st May 2018, - BOUNCE, the worldwide phenomenon that took the beloved backyard activity of trampolining and multiplied it by x100, is offering a special Buy 1 Get 1 Free promotion for customers, available only at Queen Sirikit National Convention Centre at booth C140 at [Venue please] Bouncers who wish to take advantage of the promotion will need to be swift, as the offer only lasts from today till Sunday 13 May, 2018. And, an exclusive for new users….! Book a ride to or from any of the 2 branches of BOUNCE to get 50% off* (2 times/new user) just by using code HAPPYFAM. The discount is applicable for any Grab rides (except GrabBike Delivery) from now until the 31st of May 2018. BOUNCE is a training ground for aerial sports acrobatics, a place where kids have the best birthday party of their life, a hard-core form of exercise that lets you burn energy without noticing you’re in the middle of a cardio workout, or simply a place to kick back and look out over the action. 1. BOUNCE @The Street is located on the 5th floor. The first venue in Bangkok is positioned as the largest trampoline arena in Asia, comprising 105 interconnected trampolines for sportive activities such as Free Jumping, Dodgeball League, Slam Dunk, Wall Running, Overhead Kicks on the trampoline, and giant airbags. Moreover, the 24 challenges of the fantastic and exciting newly themed indoor climbing concept from New Zealand, Clip ‘n Climb, which has turned the niche sporting activity of indoor climbing into an exciting and attractive mainstream recreational activity, will build up future rock climbers as well. The venue also includes SOUTH 38 café, as well as the XFresh, the place to get the healthiest and most refreshing natural beverages - the freshest juice bar ever! 2. BOUNCE @The EmQuartier is located on the 4th floor, Glass Quartier. Officially opened on 7 September 2016 with a total floor area of 2,000 sqm and 56 inter-connected trampoline sheets. The capacity per hour is 100 pax. Bounce is full with activities and many trampoline zones such as Wallrun in High Performance, the Free Jumping Arena, Big Bag, Slam Dunk, Dodgeball and 1 party room that can host up to 20 pax. *BOUNCE is an alcohol free fun zone. No alcohol is sold or served at any time or at any event.